Firstly, the bulk of my collection is stored in IKEA Helmers. They're small, inexpensive metal drawer units that come in four colors. I alternate between red and grey, and currently use four units. They're decorated with stickers because stickers are awesome. The thing I like about Helmers is that the drawers are super shallow, and the perfect height for a bottle of polish, so there's no wasted space! If you use this route, however, be sure to pick up some drawer liner. Otherwise, your polish will slide around when you open the drawers and that is not good for organization. Within the Helmers, I have my polishes organized by brand and that's it. Some people will further sort by color or by collection, but I find it too hard to maintain. I keep it as a display piece on top of my Helmers, which don't usually receive much indirect light. But since they are all in the Color Clutch storage case together, if I need to move them, it's no problem. Plus, if I had to leave my house in a hurry, I could just grab the case and go! I also have a nail emoji backpack that I use to transport things back and forth from my personal stash to my job as a nail technician. I use the Color Clutch 8-bottle storage case to store a stash of seasonal colors to supplement the selection we have at work. It holds the bottles in places and zips them in securely so I can toss the case in my bag without worrying about breaking bottles or messy spills. Right now I've got some fall/winter shades loaded up from Essie, LVX, China Glaze, and more. In addition to the seasonal colors, I always travel with my box of sanitized implements (nippers, clippers, pushers, and a rasp) and my box of tools (nail art brushes, silicone brushes, dotting tools, French brush, and a Crystal Katana). I also make sure I always have my Gel Play paints and Art Paints on hand. I keep the gel paints in a Lego bento box that I've repurposed for storage! 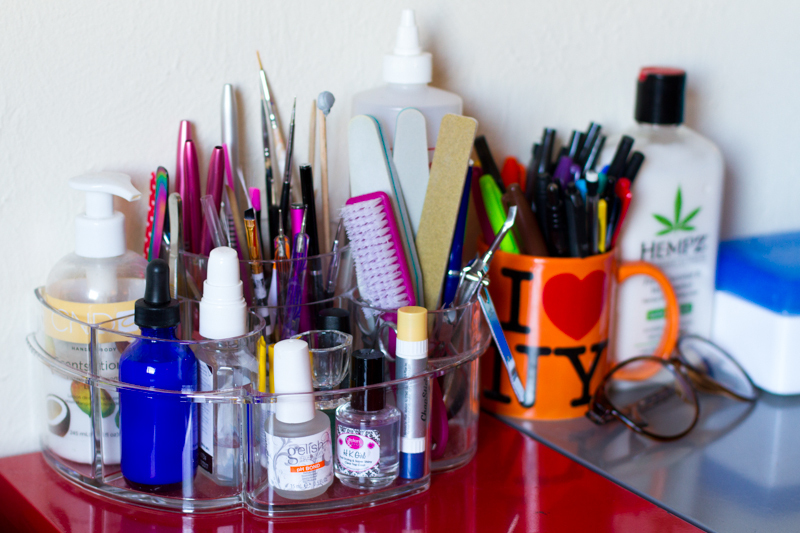 My manicuring supplies at home are organized in an acrylic makeup organizer, which I keep stored on top of my Helmers. 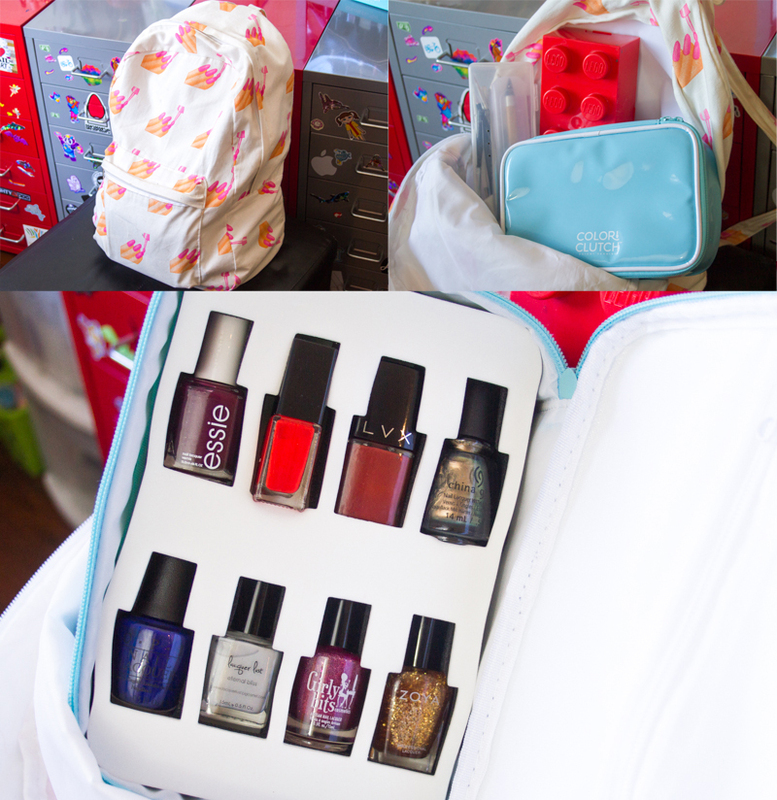 I filled the back compartment with rice so it would keep my nail art brushes upright, and have found the perfect slots for everything else (that acetone bottle fits like a glove!). I also keep a three-drawer plastic organizer for all my miscellany: flocking powder, stamping plates, mini gel lamps, backup files and buffers, etc. 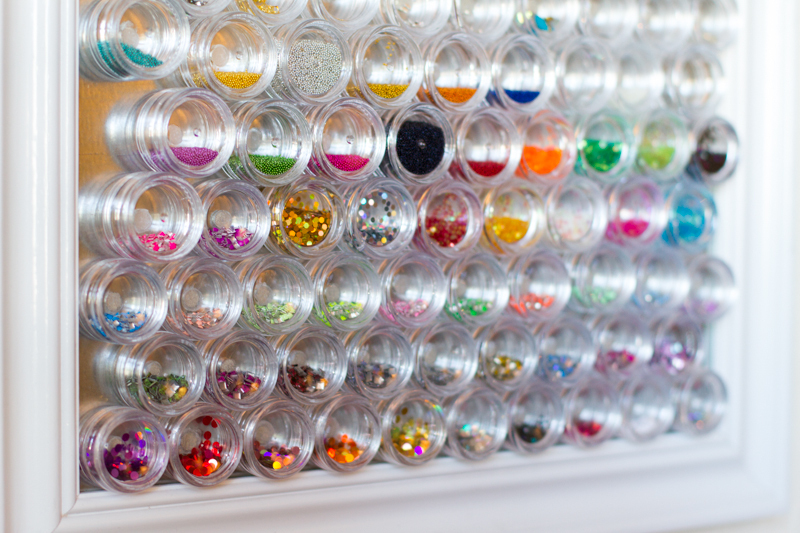 And of course, I'd be remiss if I didn't mention my magnetic nail art organizer on the wall, which I made from scratch (and wrote a tutorial for)! So that's it, now you've seen inside the madness! 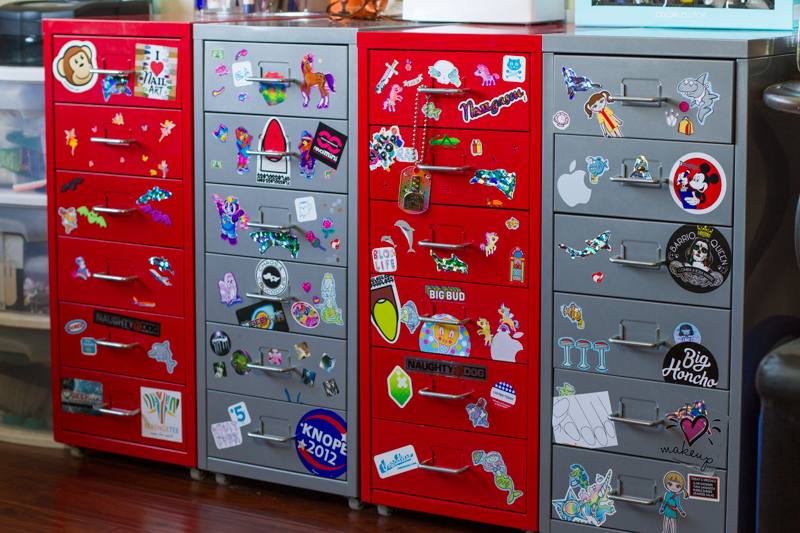 Are there any ideas here that you'd like to incorporate into your own storage system? 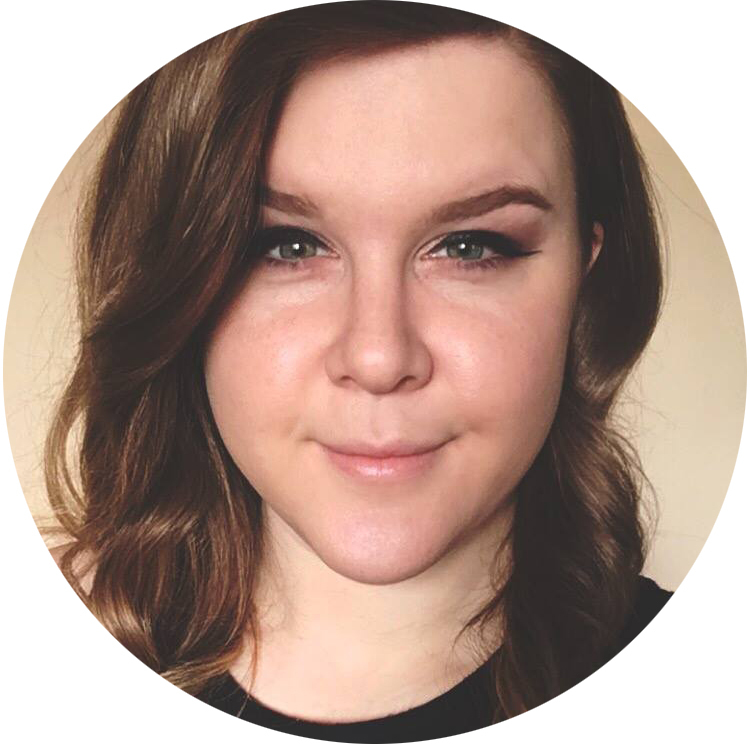 Do you have any suggestions for me of things that have worked well for you? 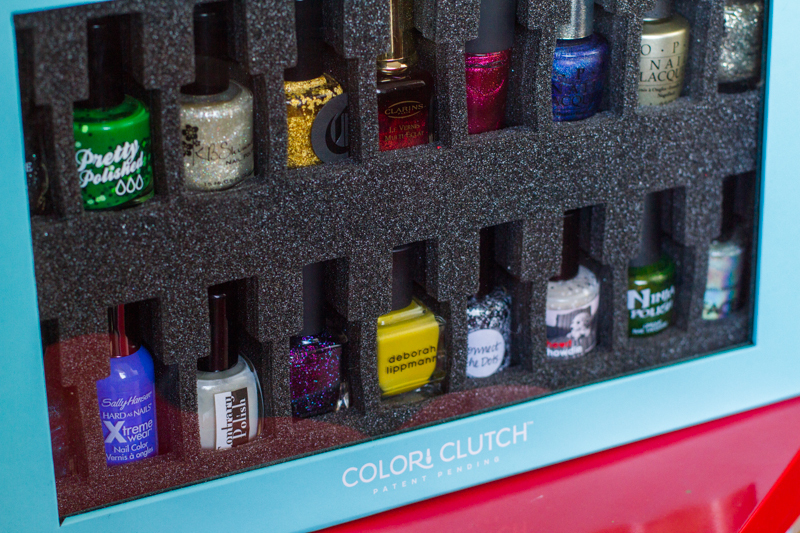 What polishes of your own would you store securely in a Color Clutch? Share in the comments below! This post has been sponsored by Color Clutch. All opinions are my own. Thank you for supporting the brands that support Chalkboard Nails!